This will get you a period looking pavillion for very little cost. You can either purchase one like this which has all the walls and everything or you can do what I did and that was to make my own walls out of sheets. You can camp right in the pre-made one. 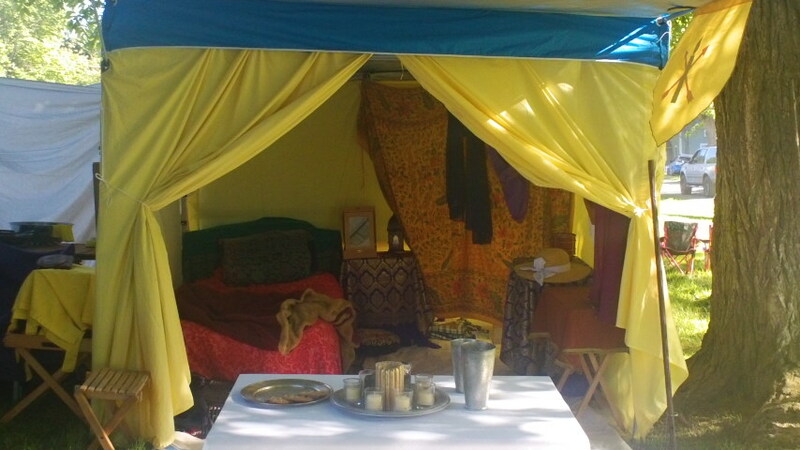 If you use sheets to make the walls, you can camp in it as long as it doesn't rain or use it to disguise your "earth pimple" (you know, those modern dome tents, which spoil the atmosphere at events). Here's how I made mine. Last year, at the end of the summer season, I bought an 8 x 8 pop-up from Rite Aid when it went on sale for 90% off. It was only $32. I regret not getting a second one. I got 5 plain flat queen sized sheets that I no longer used. Queen sized sheets fit *perfectly* as walls on an 8 x 8 pop-up as long as it has straight legs. You can get sheets in abundance at thrift stores. 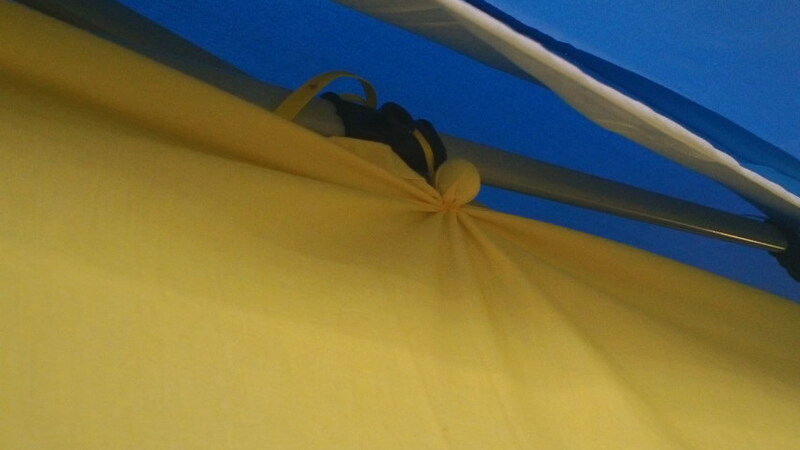 Since the roof of my pop-up was blue, I decided to dye the sheets yellow in keeping with the household heraldry. If you do this, just get some Rit Dye and follow the instructions on the box or visit their web page and youtube channel for instructions. I did mine in the washing machine and it was easy-peasy. Tip: Dye the sheets *after* you add any Velcro as Rit Dye will also dye Velcro. Now, you can either sew them all together into one long panel to surround the frame, or you can run velcro up the sides and join the panels at the corners with the Velcro. I find that keeping the panels separate makes it much easier for a single person to handle. A single person can easily put them up, take them down, fold them, pack them and wash them in a washing machine. If they're all one long giant piece, or even in 2 giant pieces, it takes 2 people to work with them. Sew the velcro all the way down the side except for the last 12". The last 12" inches of the sheet will be turned under to form a "sod cloth". The corners will go under the legs of the pop-up which will hold the walls down in place. I used the no-sew ties to help me figure out where the ties really needed to go. It wasn't until I actually had to hang them that I knew where I wanted them to go. Now that I know where they need to be, I'll be adding velcro tabs to be able to hang them quickly and easily. The door is a little tricky. You'll want to fold back 1/3rd of each side of those sheets and overlap them in the middle. You can use either corresponding twill tape to tie the door shut in windy conditions or use Velcro tabs accordingly or, large safety pins, in a pinch. To put the pavillion together, raise the roof and only extend the legs as far as needed to be able to get under it and hang the walls to the frame in comfort. Once the walls are attached to the top of the frame, extend the legs all the way. Start attaching the walls at the corners with the corresponding Velcro. Then turn the bottoms under towards the inside to create the "sod cloth". Use the bottom of the legs to hold the walls down at the corners. Next will be to either erect your earth pimple and put it in there or lay your ground cloth or mats and move in.